Last Sunday was another cold and snowy day, just like beef stew Sunday last week. 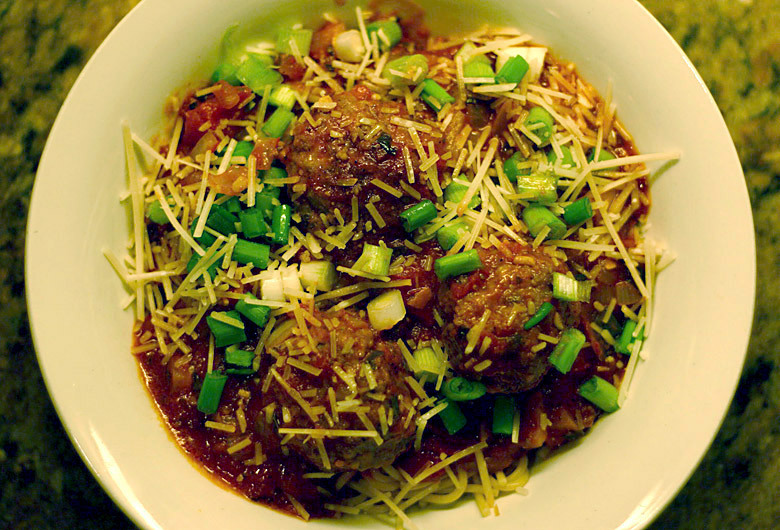 Time for some more good old-fashioned classic comfort food– spaghetti with meatballs! First, we prep by cutting up the ingredients that need to be cut up for the meatballs and sauce– the pepper, the onions, the garlic; if you can find fresh basil in the grocery store this time of year, that’s always good. To cut the basil, make stacks of basil leaves, largest on bottom, smaller on top, roll the stack of basil up and cut into thin ribbons for the sauce. Otherwise dried basil or oregano is fine for this time of year. I still have some basil from my garden that I had chopped up in a food processor and froze in single-serving containers– a little flavor echo of summer in the dead of winter. Now we make the meatballs. There’s a few schools of thought on how to cook meatballs. One is to brown them in some oil in a pan before adding them to the sauce. Other people just add the raw meatballs to the sauce and let them cook that way. That’s nice and easy, but I like to at least partially cook the meatballs before I add them to the sauce so some of the beef fat cooks out and less gets in the sauce. If you have no saturated fat concerns, starting with raw meatballs in the sauce will make for some very tasty sauce. But I decided to cook them in the oven– a little easier than browning them, and a little healthier than adding them raw to the sauce. If you decide to start the meatballs in the oven, start heating it at 350 degrees, then mix the meatball ingredients together thoroughly. When all is mixed, take a handful of meatball mixture, about enough for a golfball-sized meatball, pack it well and roll it until it’s reasonably round. Then place it on a foil-lined cookie sheet and just repeat that until you’re done. You should get about 12 or so meatballs out of this recipe (the tray of meatballs in the picture was from a larger batch I made). Cook the meatballs for about 20 minutes at 350. Green onion note: I had green onions that I diced up and added to the meatballs, and used as a garnish for the sauce, only because we had green onions that needed using, and I thought it would be an interesting variation on ordinary spaghetti and meatballs. And it was! Kristina said she really liked it with the green onions. But this is completely optional. Now for the sauce. Add the diced onions, pepper and olive oil to a pot and cook until they start to soften. Add the garlic and cook a little longer, then add the tomatoes. As the sauce starts to heat up add the rest of the ingredients and turn heat down to a simmer. Add meatballs to the sauce when you take them out of the oven. It’s done when a test meatball cut in half is cooked all the way through. Serve over spaghetti and top with some grated Parmesan cheese (and some of those green onions, if you like). Enjoy!